Our product range includes a wide range of decking sheet. With the help of our state-of-the-art infrastructure unit, we are able to provide superlative quality Decking Sheet. 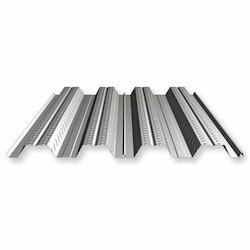 The given decking sheet enables to provide flat surface for supporting roofing as well as flooring sheets. This decking sheet is manufactured under the direction of experts in compliance with the set industry norms. Our offered decking sheet is quality tested on diverse parameters by quality controllers in order to assure its flawlessness.